This history is dedicated tp the many who aided in the accomplishment of this undertaking. My wife, Carolyn and my son Andrew who permit me to meet deadlines. My son Robert who shared in the editing. My friends who typed: Lou Ann Carmen, mary Robinson, and LaVerne Alexander, Mrs. Rubey McKtee, Church Clerk,who assisted in the research. And all the friends, members, and former members of Big Spring Baptist Church who lived this history. The winter wheat was green and growing, birds sang of the coming spring. Big Spring, Kentucky, was a busy little community with a population of two hundred. It's residents were excited about the approaching spring. The town was blessed with the presence of two physicians and one druggist. Other storekeepers included blacksmiths and jewelers, as well as owners of a general store, a furniture store, and a flour mill. The Big Spring Hotel was a favorite stopping place for those who came to observe the harness races, the track was just outside of the town. That winter the Baptists in the community had been discussing the possibility of organizing a Baptist church. The initial name mentioned for the new church was United Baptist Church of Christ; the name finally decided upon was West Big Spring Baptist Church. Thus, on 23 March 1884 members of various churches in the community came together as a council and organized West Big Spring Baptist Church. The Council included several members of Hill Grove Baptist Church and others from Buck Grove Baptist Church, New Salem Baptist Church, Bewleyville Baptist Church and New Highland Baptist Church. Their names were-(Hill Grove Baptist Church) S. R. Wrather, J.F. Williams, E. A. Smith, C. B. Sefoes, Wm. Board, R. Willit Sr., G. W. Smith, (Buck Grove Baptist Church) R. S. Dowell; (New Salem Baptist Church) B. G. Saunders; (Bewleyville Baptist Church) J. W. Albright, G. Paul; (New Highland Baptist Church) R. S. Able. The first order of business after the church was organized was calling a pastor. Bro. J. W. Albright was elected as the first pastor of the West Big Spring Baptist Church. First deacons elected by the church were A. H. Miller and John Tabor. It was decided that the meetings would be held on the third Saturday and Sunday of the month; services would begin at 11:00 both on Saturday and Sunday. On 19 April 1884 the motion was made and carried that a church building 36 feet wide and 50 feet long with 14 foot ceilings would be erected. On 17 May 1884 a pulpit Bible was given to the church by Mrs. Ben Dowell. By 18 October 1884 the outside of the church building had been completed and was ready to be painted. The first pastor's term was very brief--short stays were typical of many other pastors at West Big Spring through the years. On 3 January 1885 Bro. Albright resigned and J. J. Willet was called as pastor for the coming year. Rev. Willet was elected as pastor for the coming year on 15 May 1886; he resigned the following May. On 18 June 1887 Elder R. C. Kimble was called as pastor; he would be available for the first meeting on 16 July 1887. A highlight that occured four years after the organization of West Big Spring Baptist Church was the election and ordination of two deacsons. The two deacons elected were J. A. Taber and Gus Dowell. Bro. B. F. Hagen and Elder R. C. Kimball were invited to assist in the ordination service. Other churches invited to participate in the ordination council were Bewleyville, Hill Grove, and New Salem Baptist Churches. church's minutes of how funds were raised to pay for the building at the dedication service it was noted that the building was debt free. In the month after the dedication of the building Rev. R. C. Kimball resigned as pastor of West Big Spring Baptist Church. There followed several months in which no meetings were held. On 18 July 1890 the church voted to call Bro. Kimball again as pastor- -he deferred to answer the call until the following meeting. On 19 August the church voted to pay the paster $100.00 for the coming year and at that time the pastor accepted the call. Bro. Kimball continued as pastor until 14 March 1891, when he submitted his resignation. From April until July, Bro. J. D. Dunkin served ten~.porarily in the absence of a pastor. On 5 December 1891 the church voted to call Tom Robertson as pastor. He served till 3 September 1892, when he resigned. The church voted to pay Bro. Robertson for preaching. Apparently they had been unable or unwilling to pay the preacher at that point. During the next few months the church continued to meet and selected several individuals as pastors, but none of those who were called was willing to accept. Finally, on 13 May 1893, Bro. E. W. Barnett accepted the call as pastor. Several other pastors served through the next few years. On 14 April 1900, H. East accepted the church's call, taking a salary of $120.00 a year. A highlight of that year was a protracted meeting to begin the third Sunday in August with Bro. Montgomery Dehalf. During August of that year a motion was made to invite the Association to meet at West Big Spring Baptist Church on the following year. Delegates to the Association were elected and included Bros. John Taher, John Richardson, A. H. Miller, James Humpreys, Jas Taber, Johnnie Richardson and Guff Tabor. During the 20 October meeting the delegates reported to tile church tilat the Association would meet at West Big Spring Baptist Church the following year. In the November meeting a motion was made and seconded that the church require five cents (5_) from each member for the tent that would be used by the Associational Board. Jas Taber was to oversee the collection frown each church member. On 16 February 1901 a motion was made that the church take a public collection for the benefit of the Baptist church at Galveston, Texas. Presumably this was result of damage done from a hurricane in the Galveston area. In April of that year a committee was appointed to search for a new pastor. After a failed attempt to call Bro. Partee, Jim Willet was called as pastor on 20 July 1901. Often in the meetings they would begin by inquiring about the peace of the church--if all members were at peace they would proceed with other items of business. If all members present were not at peace committees were appointed to go and talk individually with the discontented. If the issue could not be resolved members were sometimes excluded from the church. accepted the call of the church and indicated that his salary would need to be $10.00 per month. On 19 November 1904 the church passed a motion to sanction Jim Tabor to petition to get whiskey out of Big Spring and the motion carried unanimously. The church was involved at various times with the needs of other churches. For example, on 23 December 1905 the church voted that Bro. Minter be appointed to help build a church at Constantine. In that year the church also dropped the use of "West" from it's name and became known as the Big Spring Baptist Church. The minutes of church activities from 1913 through 1922 have been lost. Asrecorded in the annuals of the Salem Association the following individuals served as pastors during that period: W. S. Shipp, H. S. English, C. E. Hamric, J. W. McGarock, J. J. Hutchinson. Bro Shipp also served as a missionary for the Salem District Mission Board and gave the following report at the Board meeting at Big Spring Baptist Church 29 October 1915. This report was in the Salem Annual for 1916. "On Monday night after the Association, we began a meeting at Big Spring, which continued for ten days and nights. There was some interest, but no professions of faith. We think the church was strengthened by the work done at this time. We think the church will be ready for self support by first of January. The two appointments for September and October have been filled and some visiting done." 17 September 1927, when the minutes indicate he was called as pastor. Another activity to which the church was committed was sending appointed delegates to the district mission board meetings of the Association. At times they indicated that they did not have enough money to support the board's work, but they would often reimburse individual members who had paid money to the board from their own pocket. The care of the church itself often became an item of concern. On 20 October 1928 one of the items of business called for a motion and second to get locks put on the doors of the church. Funds continued to be an area of difficulty.- In November 1934, after calling Rev. Joe Claycomb as new pastor, the church appointed a member to see how much money the members would promise for the pastor's salary in the coming year. We may presume that they were able to raise some money, because the next entry into the record of minutes (in August 1936) indicated that the church meeting was called to order after a sermon by Bro. Joe Claycomb. They also indicated that there were no minutes of previous meetings to be read. new deacons were ordained at the Big Spring Baptist Church: Clemmie Farrow, Daniel Compton, and Claud Borders. raised to buy the paint. another member was released from the committee having turned in $16.75. By August 1939 the financial situation had apparently improved and the church voted not to ask the Board for financial help during the coming year. Nineteen thirty-eight began a period during which a pastor, Brother D. V. Keys, remained at the church for several years. He was called as pastor in October 1938 and resigned in March 1943. During the period of 1941-42 much discussion occurred concerning the starting of a Sunday School. On 25 April 1942 an item of business indicated the starting of a Sunday School had been discussed but no satisfactory plan was reached. In May 1942 the church elected Miss Irene Miller as Superintendent for the Sunday School. In August 1942 the pastor gave a report which reflects the financial condition of the Salem Association: "After a sermon by the pastor, Bro. D. V. Keys, we began our business meeting with Bro. Keys as moderator. Bro. Keys told of his attendance (1 day) at the Salem Association meeting on Wednesday and Thursday with the New Highland Baptist Church. He made a report. (We can proudly say that we had Bro. Keys salary paid in full, to date.) He tells us the Board is yet helping a lot of the weaker churches. Large crowds attended." Another item of business in that same meeting indicates that Bro. Keys, pastor of Big Spring Baptist Church, was also active in conducting Revivals in the community. "Motion was made and seconded that we hold a Revival meeting sometime soon (in the near future) question is whether to have it in church house or Bro. Keys Gospel Tent. (Decide later)." Rev. Keys resigned in March 1943. In July 1943 the church voted to invite the Women's Missionary Union to hold meetings in Big Spring Baptist Church. The Women's Missionary Society at the Big Spring Baptist Church was organized 23 October 1947. * The organizational meeting was assisted by members of the Buck Grove Baptist Church. Officers elected for the new organization (through the coming year of 1948) were Mrs. Paul Johnson, President; Mrs. Arnold Drake, Vice-President; Mrs. Lester Lockard, Secretary and Treasurer; Mrs. Martin Miller, Community Missions Chairman; Mrs. George Prather, Chairman of work with young people; and Mrs. Frank Hilf, Mission Studies Chairman. The members enrolled in the organization 1947 were Mrs. Lillian Dowell, Mrs. J. B. Norris, Mrs. Arnold Drake, Mrs. George Prather, Mrs. Frank Hilf, Mrs. Martin Miller, Mrs. Lester Lockard, Mrs. Luther Miller, Mrs. Milburn Thornhill, and Mrs. Lannie Poole. The first regular meeting of the group was held in the home of Cora Johnson 6 November 1947--nine members were present and one visitor. The community missions report for November of that year indicated the type of activities in which the group would be very active in the years ahead. They indicated that they had visited a lady in the community who was confined to her bed-- they had made some clothes for the individual and also had taken in food and had a prayer meeting before leaving. The group continued to be very supportive of individuals in the community who had special needs through the years. The group has consistently sent cards to the ill in the community, whether they were at home or in hospitals. *The 1922 Salem Association Annual includes a Women's Missionary Union on the Big Spring letter with thirty-six members. Mrs. J. V. Norris is listed as President of the WMU in 1924. No record of this organization is found in the church minutes from 1922 until after the 1947 date. A significant activity in which the Big Spring Baptist Church W.M.U. became involved centered around a celebration in the Big Spring Community that became known as "Down Home Days." Under new business at the W.M.U. meeting on 7 March 1974 the following was recorded: "Project for the Centennial to be held in Big Spring sometime in June was discussed. Eva Mae donated a quilt top. Missionary women are to quilt it and sell it that day. Ruby has a quilt to be quilted and will pay the women to do it. Decided to sell food at the Centennial one day." By the meeting of 9 May 1974 the group had made a commitment to sell food on both days of the Centennial which was to be held in Big Spring 1-2 June. The report for June 1974 included the profits from the Centennial celebration, $498.15. This money became the seed money for project which the W.M.U. discussed: providing restrooms for the Big Spring Baptist Church. That beginning became a yearly activity for the women of the Big Spring W.M.U,--feeding the community with the money going toward the project of adding restrooms for the church. The minutes for 11 April 1974 give an indication of the type of commitment the women of the Big Spring W.M.U. had in the community. It indicated that the Missionary Women had worked at Brandenburg for one day helping tornado victims. Big Spring community sent groceries amounting to about $150.00, as well as clothes. Scattered throughout the brief minutes of the group are other indications of the attempt of the W.M.U. to assist families in the community who had suffered losses of homes and household items in fires and natural disasters. February to begin collecting money for the repair. The motion was "That we take all our money (W.M.U., (Moorman Day Money,) and balance left from painting church, and help put on the ceiling material)." Mrs. Paul Johnson was instructed to order the materials for the repair of the ceiling. They also discussed and provided for the nailing down of the roof of the church. If any money was left over they were to explore the possibility of wiring the church. In April 1944, while the church was being repaired, they were invited to meet in the Big Spring Methodist church for their services. The cooperation of Big Spring Baptist Church and the Methodist churches in the area dates back a good way and continues to the present. In August 1944 the church voted to express appreciation to Mrs. Lillian Dowell who had donated money to buy a Communion set and the collection plates. These were donated in the memory of the late W. P. Dowell. In 1945 a motion was made and seconded that the church would start a "Birthday offering" for the Orphans Home. The pastor volunteered to get a box in which the offering would be collected. Use of the birthday offering has continued down to the present time. The first insurance purchased on the building was mentioned on 28 October 1945, insuring the building for $1500.00 at a cost of $20.40 per year. The salary for the pastor in October 1945 was $15.00 per Sunday for two Sundays per month. They were hoping for the possibility of having a service also on another Sunday. A constant item of business from the very beginning of the organization of the church has been the need to provide for the repair of the road from Big Spring out to the church. On 24 March 1946 the minutes record that Mr. Johnson paid Sam Brown $74.10 for hauling gravel for the repair of the road. In April 1946 the first mention of the Cooperative Program was made: "Bro. Stone handed out booklets on "The Baptist Cooperative Program". The church was requested to donate 10% of their funds to the State Mission Board. By 1948 the salary of the pastors had risen to $40.00 per month. The pastor called at this time, Percy Magee, was a student at the Seminary. The church continued to be active in the work of the Association--they voted to send $6.00 for twelve copies of the minutes in 1948. In that same meeting they voted to put together Rev. Magee's salary for the month with Revival money--to be paid in a lump sum of $216.48. In the 5 December 1948 meeting the church discussed whether to have a motion picture of a Christian nature shown in the church in the near future; the motion was not carried. They did vote to have a"little program and Christmas tree at church on the third Sunday afternoon at 2 o'clock." On 26 February 1949 the church voted to give one tenth of all collections to help pay the expenses of Bro. Harold Marsh, a missionary in the Salem Association. The comment with that item was "for his great work that he is performing." The next item of business in that session included an admonition that each member be asked to increase their gifts to the church. pastors from New Salem, Grandview, and Constantine churches. Somewhere along the way the church had stopped using wood for heating the building and had switched to coal. On 3 September 1952 the church voted to order two tons of coal for the church. In the following meeting in March the church voted to order two tons of coal for the church. In the following meeting in March the church voted to hire a sexton to build the fires in the church, the amount to be paid for building the fires was forty cents. The burden of paying the salary would be shared, with the Sunday School paying one-half and the church paying one-half. On 8 April 1953 the church treasurer, who at that time was George Kaelin, was voted to also function as treasurer of the Sunday School. Items necessary for the Sunday School would be bought out of the Sunday School money. In May 1953 the church bought-one ton of coal at a cost of $14.75. In the summer of 1954 the church voted to begin having Training Union, this under the leadership of Bro. J. H. Ball, who had been called as pastor in October 1953. In the July meeting of that year they voted to begin full time services at Big Spring Baptist Church. By October of that year Bro. Ball had been dismissed and the church had voted to go back to a part-time basis. The next three years saw three pastors-Bro. Stacker, Bro. Gilbert and Henry McInnis, who was elected pastor in 1957. On 3 November 1957 a business meeting was conducted under the direction of Bro. McInnis as moderator. A motion was made and seconded and carried that the church business meeting be held after preaching services on the first Sunday night of each month. A discussion was held concerning how much the church should give for the Associational Missionary home and a committee appointed to work out a plan. They also discussed having a Cemetery Fund and a committee was appointed to work that out. The church clerk, Mrs. Wayne Jackson, gave Bro. McInnis a letter that she had received inviting the Big Spring Baptist Church to bring as many boys as they could to an Royal Ambassador conclave at Ekron Chruch Wednesday night, November 6th. There was some discussion about getting the boys interested in R.A.'s and trying to organize a group in the church. The following month the Cemetery committee was appointed, the committee was Paul Johnson, George Kaelin, Tula Kaelin, and Edith Lockard. Two business meetings later the church voted to give $12.00 toward the new addition on the Missionary's home. The cemetery committee reported and recommended that each immediate family be asked to pay $3.00 per year for clean up and up-keep of the cemetery, and $2.50 for each grave. The following month the cemetery committee indicated that they would be typing up a letter that would be mailed out to individuals as soon as possible. In the 2 March 1958 meeting they voted to have a Bible School that summer. Teachers and staff were appointed for the Bible School, no date was set. At the next meeting a date was set for the Bible School. It would begin 21 July and run through the 25th. They also voted to have a revival which would begin 3 August and run through the 10th. On 4 May 1958 a motion was made and seconded that a census be taken of the community for the purpose of reaching the unsaved and building up our Sunday School and Vacation Bible School. The time set was 8 June. They also voted to take down a fence along the front of the parking lot and to put gravel on the parking lot. The following business meeting they voted to pay George Kaelin $185.00 beginning 1 April 1958 running through 1 April 1959 to take down the fences and keep the cemetery mowed--the motion was accepted. Immediately following the June 1958 business meeting minutes was a note concerning a marriage conducted by Rev. Henry McInnis on Friday night, 27 June 1958, between Miss Beverly Neff and Mr. Wayne Cundiff. been called as pastor. In the July business meeting they voted to call off Vactation Bible School and set the time for the revival as 17-23 August. The church voted on 2 August 1959 to request that Bro. Armbrister's home church in Bluefield, West Virginia provide ordination into the ministry for the pastor. On 11 May 1960 the church met in business meeting for the purpose of calling a new pastor. A secret vote was taken and the vote was unanimous that a new pastor be called. Cora Johnson was instructed to write Bro. Joseph Stiles, field director for the Southern Baptist Theological Seminary and have him send a new preacher. On 21 June 1961 a business meeting was held and it was noted that it was the first business meeting since 10 August 1960. In the interim Bro. Humphrey had been called as pastor. They voted for the Sunday School to go to the Falls of the Rough River Dam for a Sunday School picnic on the first Sunday in July. They agreed to have church on the fourth Sunday in July so Bro. Humphrey could go to his father-in-law's church on the third Sunday to conduct the preaching services. They voted to change the time for Sunday School and church services from slow time to fast time, Sunday School to meet at 10:00 and church at 11:00. On 30 July 1961 they voted to request that Bro. Taylor come and preach their revival, 14-24 August. Apparently the requested minister could not come because in the 23 August business meeting a motion was made and seconded to extend our appreciation to Rev. Clyde Tilly for the wonderful message he brought each night. On 6 September 1961 they held a Wednesday night business meeting after Prayer Meeting the purpose of the meeting was for the calling of our pastor back or a new bone. Paul Johnson acted as moderator, a vote was taken and the majority was in favor of calling Bro. Humphrey back, "if he would accept the call and the rules the church asked for." A motion was made and seconded carried that the church pay three dollars a trip to the pastor when the church requested his service beyond the regular call of duty and that our church will have first call on his services at all time. 2. Visit people throughout the community especially during revivals. 3. Conduct a business meeting the first Sunday of each month following each evening service. 4. Our church should have first call on all the pastor's services. 5. Pay not to exceed $20.00 per Sunday except by agreement of the church. 6. Communion service to be held the first Sunday of each quarter. The next business meeting is dated 15 April 1962 the business meeting is held under the direction of Bro. Jim Richardson, pastor, as moderator. The minutes indicate that he was a Southern Baptist Seminary student at the time. At the business meeting the following month, a time for Vacation Bible School was discussed and set for 6-10 August with the pastor serving as principal. A revival would begin on 13 August and continue through the 26th, Bro. Richardson would preach the first week and Bro. Jack Goodwin the second week of the revival. The church also voted to erect a building for tools and coal. On 3 June 1962, the church voted to observe Sunday the 24th as a time to give 50% of the offering to the cooperative program. At the following Business Meeting, it was decided that the building for coal and tools would be '3 x 12 feet with an estimated cost of $140.00. It was also voted to take out the security light in front of the church. On 5 May 1963 the church accepted the resignation of Brother Richardson to become effective 1 June 1963. He had been called as pastor of the Powereville Baptist Church in Kentucky. During May Brother Richardson was appointed to attend the Southern Baptist Convention in Kansas City as a delegate from Big Spring Baptist Church. The church extended a call in September of 1963 to Tyson Rogers. He did not accept and on 23 October Brother William L. Conley was called as pastor. The pastor's salary would be $15.00 each Sunday to be paid once a month. gave the invocation, Reverend Felix Montgomery preached ordination sermon, Reverend Blane Tucker gave the charge to the candidate and Reverend Ray Bateman gave the charge to the church and the dedicatory prayer. Brother Paul Johnson and Brother George Kaelin presented the Bible from Big Spring Baptist Church to Brother Conley. After the laying on of hands by the ministers and deacons, the benediction was given by Brother Conley. On 12 February 1964 there was a discussion of Christian Education Advance. The program was explained by Brother Conley. Big Spring Baptist Church was asked to give $954.84 in a four year period. A further item of business at that meeting involved the need to pay the fire insurance of $15.00. The church requested Mr. Kaelin to see about a higher amount of insurance coverage for 1964. The amount of coverage at that time was $2500.00. It was noted in the 18 March business meeting that the pastor's salary was $100.00 per month and the janitor's salary $6.00 per month. Sunday school literature was to be $7.00 per month. $4.00 per month was to be set aside for operation of the Church. $9.00 per month for building and equipment, lights and insurance. $20.00 per month was to go to the building fund. A miscellaneous item was to be $15.00 per month. The budget was approved item by item. In April an Easter Sunrise Service was scheduled to be held at 6:30AM. A motion was made, seconded and passed to designate $20.00 of Cooperative Program monies for the next two months to the West Point Church for flood damage. A committee was appointed to canvas the church members about the building program; "Whether to remodel or build a new Church". A report was to be given at the next business meeting. At the following business meeting on 30 April 1964 a committee was appointed to make an estimate of what it would cost to remodel the church and build Sunday school rooms. Members on that committee were Brothers Kaelin, Bowers, Hilf, Neff, Johnson, Miller and Daniels. The committee was to meet during the first week of May to draw plans to present to the Church on Wednesday, May 6th. The committee was to contact construction firms for estimates on remodeling the present building. The building committee's report was accepted at the business meeting on 6 May 1964. In May of 1964 the Sunday school had an enrollment of 73 with an average attendance of 69. In July a training union was organized with 11 intermediates enrolled. Brother Bowers was the leader. Brother Bernard was to lead the junior group. The building committee reported that an estimate of cost would be presented at a special business meeting July 15th. The work that was to be bid upon included the following: level floor, pull building together, put stone-effect metal siding around outside of lower part, lower light fixtures and ceiling. A motion was made and seconded and passed that the listed work be done. At the special business meeting on 15 July 1964, the following bids were received for remodeling on the church building: Walter Compton $765.00 plus $234.00 for ceiling work for a total of $999.00. Charles Bernard $1,000.00 for the entire bid. Motion made, seconded and passed to award Mr. Bernard the work of remodeling the church building. In August of 1964 the Sunday school had an enrollment of 74 and an average attendance of 66. The offering for the month was $167.98. Total contacts 33. New enrollment 3. The training union had an enrollment of 25 with an average attendance of 20. The W.M.U. reported that they donated $28.00 from a Stanley Party for the building fund. At the 9 September 1964 meeting, Or. Bowers, Mr. Neff and Mr. Kaelin were appointed to serve as the building committee. Each window donated to the church will be $50.00 per window with a name on the window. The bids that were received for installing heating units in the church building: Berkheart Heating $950.00, Radcliffe Plumbing and heating $1060.00. The building committee voted to accept the bid of Berkheart Heating for $950.00. A motion was made seconded and passed for the church to borrow $2,000.00 from the Farmer's Bank of Vine Grove, Kentucky, to complete the remodeling of the church building. In the 7 October 1964 remeeting, the church voted to draw numbers to decide the location in the church of the donated stained glass windows. At the 13 December 1964 meeting, the church voted to license Brother Hampton to preach the gospel. On l0 February 1965, it was noted that Brother Conley would be retiring from the Armed Services May 31st and will be looking for a full- time pastoral. A called business meeting was announced for 17 February' at 7:30 PM at the Church to decide about going full-time. At the called business meeting on 17 February, the Church indicated that they were financially unable to increase the-minister's salary at that time. They indicated they would have to consider releasing him to seek another church. A motion was made, seconded and passed to pay Brother Conley $20.00 per Sunday when he would preach and pay a supply $20.00 when Brother Conley was away. On l0 March 1965 they revised that amount to $25.00 per Sunday. donations to the CEA fund would cease until further notice. On 30 June 1965 the Church discussed whether to call Brother Candy as Pastor. They decided to have Brother Stephenson come back again. The Church again indicated what it expected of a pastor. (1) Take interest in children and young folks. (2) Visit aged and sick regardless of denomination. (3) Helping Bible School and Revival. (4) Be available when needed anytime in case of sickness or other needs. On 7 July 1965 they indicated that Sunday School enrollment was 87 with an average attendance of 54. On 4 August 1965 "an overwhelming majority voted to call Brother Takahiro Que"(a 22 year old Japanese from Vine Grove Baptist Church). They also voted to take a free will offering for Jack S-.Mr.~ons in appreciation for his help as principal of the vacation bible school. They also voted not to have church service Sunday, August 8, as everyone was attending our neighboring Methodist church service. On 6 October 1965 the church voted that the building committee would draw tip plans for Sunday school rooms. They also voted to use $i00.00 from the church treasury to build the rooms. 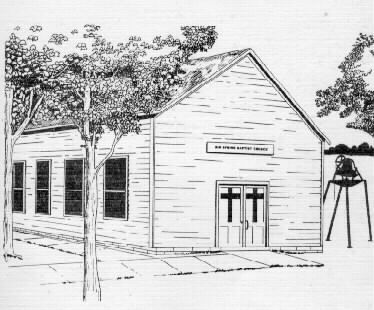 At the following business meeting, they accepted plans from the building committee that there would be three Sunday school rooms. At the Business Meeting of 5 January 1966 the minutes note that Mr. & Mrs. Neff went to see Mr. & Mrs. Martin about ground offered to the Church. church council consisting of pastor, deacon, Sunday school superintendent music director, and W.M.U. president. On 8 June 1966 it was indicated in the business meetings that $80.00 earned by the W.M.S. would need to be turned over to the building committee in order to finish the floors of the Sunday school rooms. At the 6 July 1966 business meeting, the church voted that they would start having night services on Sunday July 17th beginning at 7:30PM. In August of 1966 the church voted to call the pastor for an indefinite period. A yearly meeting would be held to discuss progress. A motion was then made and passed to call Brother Takahiro Que as pastor for an indefinite period. At a called meeting on 21 September 1966 it was indicated that the church voted to give $35.00 to Mr. & Mrs. Simmons in appreciation of their help during Vacation Bible School. The church voted in October to request Josie Dowell to turn on the heat Sunday mornings. The pay would be the same as for the previous year. The church agreed to give Brother Takahiro Que permission to attend prayer meeting in Louisville on Wednesday nights instead of making the trip down to Big Spring. In November the Sunday School reported an enrollment of 85 with an average attendance of 62. At the 5 April 1967 meeting Brother Kaelin reported that the church debt had been paid off. erecting the church bell was discussed, everything was ready except for the concrete. The church agreed to buy ready mix concrete. Immediately following the regular service on 24 September 1967 the church voted unanimously to send WHAS Crusade for Children a check for $25.00. The intermediates of the church also sent $10.00 to WHAS Crusade. On 11 October 1967 Mrs. Rudy Mcatee requested the church to pay the postage for boxes that the W.M.U. was preparing to send to the boys in Viet Nam. Mr. James L. Neff moved that the church do this to send the things to Viet Nam. The motion was seconed and passed. In November 1967 Brother Roy Miller accepted the call to be the pastor of the church. The salery for the pastor was $125.00 a month. Preaching services would include every Sunday morning and night. At the 21 January 1968 business meeting a commitee was appointed to investigate the ground that Mr. Carl Martin had offered to the church for purpose of extension. Brother Miller appointed the following to be on the committee: James L. Neff, George Kaelin, Ruby Mcatee, and Roy Barnes. On 25 February 1968 Brothers Ernie Carmen and Johnny Daniels were both ordaibed as Deacons of the Big Spring Baptist Church. On 10 April 1968 the building committee reported they had decided to extend the church on the back and divide the rooms with folding doors. The plans were further explained and discussed. Mr. Roy Barnes gave an estimated $4500.00 for the addition. requested that these stamps be used to buy chairs for the nursery. Betty Atkins moved that the women contribute these S & H green stamps to supply the church with the needed equipment. The motion was seconded and carried. It was suggested that the W.M.U. sponsor this effort. At that same business meeting, it was reported that the church bell had been erected. At the 5 June 1968 meeting Brother Miller gave a report on materials for the church to include 43 strips of plywood for the floor for $212.85 and 1,360 sq. feet of tile at a cost of $299.20. At the 4 September 1968 meeting the building committee reported on a meeting with a representative for a company who would provide church pews. The pews and pulpit came to a total of $1800.00. It was recommended by the building committee that the church explore borrowing money from the Farmer's Bank. The church further directed that they buy 50 extra chairs for the choir and Sunday school rooms. It was voted that Roy Barnes and George Kaelin be permitted to go and borrow that amount of money. On 12 September 1968, a called business meeting was held. "This was a special meeting to decide where to look for a pastor as well as what age person to try to find." In a continuation of that same meeting, George Kaelin stated that the Farmer's Bank of Vine Grove had required the majority of the five deacons to sign the contract to borrow $2000.00. The bank requested the church to call a business meeting and vote to authorize the deacon's of the church to borrow the $2000.00. The church voted to authorize the deacon's to borrow the money and purchase the new pews. With a Sunday school average attendance of 53 and a deep commitment to the improvement of the sanctuary evidenced by their willingness to borrow the necessary money, the people of Big Spring Baptist Church moved ahead with plans for the improvement of their sanctuary. In the church years of 1968 and 1969, the church records indicate the total value of church property was $15,500.00. The pastor's salary for that year was $2600.00. In the October 1968 business meeting someone inquired about when the church was going to purchase the land behind the church. "It was stated that this land cannot be purchased until the church decides to build". Other items mentioned in that particular business meeting included the fact that the church letter which had been sent to the Association as reported by Roy Barnes, was graded as excellent. Someone noted that the old pews would need to be removed from the sanctuary at the time of the arrival of new ones. Paul Johnson agreed to take care of the pews. Wayne Ray moved that we sell the long benches for $3.00 each and $2.00 for a short bench. The motion died for lack of a second. There was considerable discussion about the pews and someone moved that the pews be given away and made a motion to that effect. The motion with an amendment that donations would be accepted was carried. On 3 November 1968 after Church services, George Kaelin told of a preacher that the deacon's had interviewed. This minister had asked for a salary of $200.00 a month but indicated they also tithed. The church voted unanimously to invite this man to preach on Sunday. was also given to her. Brother Ed Gullic was the visiting minister that Sunday and it was indicated that he was to find a preacher for the following Sunday. At a called business meeting on 20 November 1968 Brother Lee Gallman was called as pastor. Discussed in that same meeting was the purchase of 50 chairs for use in the Sunday School. The estimated total for the chairs was $200.00 to include clamps for clamping the chairs together. It was moved that James Neff purchase the chairs. The motion was seconded and carried. Marguerite Neff stated that they had bought the filing cabinet for the Church at a cost of $23.70 and wanted to know how it should be paid for. The two options discussed were to pay for it from the church treasury or to cash-in the stamps for $2.00 a book. It was moved that the church would pay for the filing cabinet and the Missionary Union would purchase a coffee urn and a hot plate with the stamps that they had collected. also suggested in response to a discussion about how to preserve the records of the church that the records should be microfilmed and kept in the library at the Southern Baptist Seminary, Louisville, Kentucky. In May 1969 Ernie Carmen reported the business that had been discussed at the deacon's meeting. "The first item was the payment of the pastor when neither he nor any other preacher could get to the church because of weather conditions. If the pastor called the chairman of the Deacons and Brother Barnes and they were in agreement that the roads were impassable, the pastor would still receive his salary. This was discussed. It was moved the above suggestion be accepted. Seconded and carried." Brother Gallman reported that he could not find any more history concerning the church. He noted that they could have the church books microfilmed for one and one/fourth cents per page and that either the Church or the Seminary could keep the books and the microfilm in their library. The church decided to have the books microfilmed with the church keeping the microfilm and leaving the books at the Southern Baptist Seminary. In the June 1969 meeting the building committee made recommendations to the church that wall cabinets, a broom closet, a work bench and a tack board be built in the beginners room and that they also build a choir rail. The church voted to hire Brother George Kaelin and his assistant to build the choir rail. The revival for that summer was discussed with Brother Leo Evans of Michigan being invited to preach and Brother Lee Gallman being asked to lead the singing for the revival. Plan. The Church voted to start the Broadman Library Plan for one year. The deacon's recommendations presented in the August 1969 business meeting, included the recommendation that the church be cleaned once a week by Mrs. Josie Dowell. The payment decided upon was $5.00 per week. The deacons also recommended that an attic fan be put into the church. That particular recommendation was moved and then tabled. Johnule Daniels stated that he would paint the church roof for $35.00. In November a special building sub-committee was discussed. This committee was seen as a special committee whose function would be to examine in detail the needs of the church in terms of future buidlings. Five persons were appointed to serve on the committee as follows: Mrs. J. L. Neff, Mrs. Ruby McAtee, Mrs. Ernie Carmen, Mr. George Kaelin and Billy Adkins. At the March 1970 Business Meeting the financial situation of the church was discussed at length. A recommendation was accepted from the deacons that the pastor's salary be cut to $40.00 per week. Another suggestion was made to borrow money from the cemetery fund to pay outstanding bills. No motion was made. as a deacon in the future. On 4 October 1970 the church voted to participate in the work of the Association. The church was the only one at that time that was not providing any financial support for the Association. It was decided to send $5.00 a month to Salem Association to support the work within the Association. A service was held on October 18, at 2:30 PM for the examination and then ordination of James Lewis Neff. At the 6 December 1970 business meeting, pastor Gallman offered his resignation to be effective on 20 December 1970. Ernie Carmen made a motion that the church accept the resignation by Brother Gallman; the motion was seconded by James Neff. The church voted not to accept the recommendations. Brother Gallman gave reasons why it would be best for the church to accept. A vote was taken again and carried. A deacon's recommendation in that same business meeting was "to abolish the annual call so as to be able to dismiss a pastor by majority vote at any monthly business meeting." A motion was made and seconded by James Neff and the motion carried. At the 7 February ]971 business meeting, Brother Townsend was called as pastor of Big Spring Baptist Church. Brother Townsend stressed the importance of organization within the church. He noted that the bylaws and constitution that the church was working on was a step in the right direction of organizing and getting started. the church voted to pay $75.00 per week to Brother Townsend as an interim pastor for an indefinite period. "Members discussed some of the burdens that this might be on the church because of not much money in the treasury." In March the church discussed raising the amount of insurance on the church bud' cling up to $25,000 if that were possible. A treasurers report is included for April of 1971 and included an income of $546.00 for the month of February and expenses of $486.00. The Easter Sunrise Service in 1971 was at the Methodist Church with Brother Townsend preaching. In June of 1971, an item of business indicates that Brother Carmen is to find out about Brother Townsend and "if he isn't coming back to get someone else to come." Brother Robert Elliott was called as pastor on 1 August 1971. On 3 October 1971 the church reported a Sunday school average attendance of 34. A motion was made that a building fund be started With the motion being amended that the fund would not be used for any other purpose unless brought before the church and any funds borrowed would have to be paid back. Ruby McAtee made a motion to appoint a committee to compile the church history with Brother Pollock as secretary. On 19 February 1972 the church voted to buy a new piano at a price of $775.00. The money was obtained by borrowing $600 from the cemetery fund at no interest and $200.00 from the bank in order to purchase the piano. The balance in the treasury report that month was $28.47 and the balance in the building fund was $178.00. Spring Baptist Church held its monthly business meeting on November 5th. meeting . . . ." There are no other minutes that follow in this particular book of minutes. The next record of a business meeting is dated 13 January 1974. The pastor in 1973 as listed in the statistical information of the minutes of the Salem Baptist Association was James Oliver, a Seminary student. The next minutes from 13 January 1974 state that the business meeting was called to order by Bro. Jim Oliver. In that business meeting the building committee reported that the pump which would provide water to the church had not yet been installed. The average attendance in Sunday School for January was 38. At the following business meeting on 3 February the church still owed the cemetery fund $552.00. At the following business meeting they continued the discussion concerning the well and indicated that the pump was in but the faucet would be put in later. Marguerite Neff moved in the March business meeting that the church make plans for restrooms. After a discussion that it would not be possible to do so at this time, Marguerite with drew her motion. also discussed the Bi-Centennial at Brandenburg and the need for someone to sell food to people coming in to Brandenburg but no decision was reached. In the July 7th meeting they gave a report that the W.M.U. sale totaled $498.15. The building fund report gave a balance of $1286.83 as of June 15th. Bro. Sylvester asked the church that he be allowed to be ordained in the Twenty-third and Broadway Baptist Church as he had previously planned to do before accepting the pastor's position at Big Spring. The pastor's salary was set at $40.00 per week with $10.00 travel expense. On 13 September 1974 the youth report indicated that the Youth Revival that they had made plans for had been held and Bro. Conley had preached. In the 2 March 1975 meeting James Louis Neff had a building plan and explained it; "the structure would extend the length of the back of the church with Sunday School rooms and restrooms." A suggestion was made that the outer structure be started with carpenter help and the inside work to be done by members, with any help being appreciated. Mrs. Neff moved that the Building Committee be authorized to have plans drawn for the structure if Mr. Bower could not do them in the next three weeks. It was reported in the April meeting that Mr. Bower had the plans ready but nothing had been done up to that time. In the meantime, it was noted that a new door was needed on the outdoor toilet. In May a piano dedication was discussed. Bro. Sylvester suggested that he be permitted* to ask someone to come play some special music for the dedication. They would set the date later. In the June meeting a letter from the Salem Association concerning their financial needs was presented to the church for consideration and discussion. The conclusion reached was that the church compose a budget to support the different organizations. In December 1975 a goal for I.ottie Moon Christmas Offering was set at $100.00. It had been approximately that amount for the last few years. On 18 January 1976 an unscheduled business meeting was held to discuss the resignation of Bro. John Sylvester. Bro. Sylvester submitted a letter of resignation. Bro. George Kaelin presided and the church voted to accept the resignation. As his last function at the church on l February 1976 he baptised Brenda Carr,~an into the fellowship of Big Spring Baptist Church. The baptismal services were held at Buck Grove Baptist Church with Bro. John Sylvester officiating. Attending the service were Mrs. Mary I.ou Bower, pianist; Mr. and Mrs. George Kaelin; Mrs. Neva Payne, Mrs. Ethel Haynes, Mrs. Ruby McAtee, Bro. and Mrs. John Sylvester and Mr. and Mrs. Ernie Carman and girls, Darlah and Angela, also attending were Mrs. Pearl Carman and Lou Ann Carman. This report was signed by Ruby McAtee, Church Clerk. fellowship hall audition measured thirty-six by thirty. In the July 1979 meeting it was indicated that the plumber would go ahead and install the septic tank and would split the bill for the plumbing into three payments. In October the building committee reported that concrete for the foundation of the building had been poured and blocks had been purchased for the foundation. In August of 1980 the pastor reported for the Building Committee that the builder's sheetings was in place on the side of the building and trees immediately adjacent to the new building had been cleared. The 8 February 1981 meeting agreed to accept an electrician's bid of $400.00 to wire the fellowship hall. The building committee also reported that the insulation of the well was underway and a heating contractor was coming to make an estimate on a furnace for the new building. On 10 May 1981 the building committee indicated that the carpet was in and the final payment to the plumber was due. In the September meeting of 1981 the church yoted to per,it the communities Homemakers group to meet in thefellpwship hall during bad weather. At the 8 November 1981 ,eeting the church discussed the dedication of the new building on November 29th at 3:00 p.m. The church set as their goal to finish paying all indeptedness be that date. Bob Jones, Director of Missions, of the Kentucky Baptist Convention was asked to be the speaker. the church had recieved from Kentucky Baptist a grant of $2,000.00 on the new building. Sunrise Service and Vacation Biblie School held jointly with the Methodists in the community, revivals have been held each year, along with January Bible studies. Continuing renovation of the sanctuary had also been a project during this period. Three thirty-six foot bolts were placed underneath the sanctuary to draw together the outside walls of the building. And so passes one hundred' years in the life of a small rural Southern Baptist Church. New buildings are important. So are bolts that bind together walls that have borne the burden of summer heat and winter cold and fierce winds that come off the ridgeline. But more important if the church is to reach out into the next one hundredyears is the sure position of God's word in tile hearts and lives of it's people. Lives that are open to the Spirit of God ever flaking the written word become the living word. Lives open in many, many ways to God's love-that great love that we have experienced through Jesus Christ our Lord and Master. That strong love which Paul calls the highest and best gift as he speaks about it in the Thirteenth Chapter of I Corinthians. May such love grow and grow within the hearts of the church that worship within the walls of this "Little Country Church". it's history marching for a hundred years. white walls sing the passage of time. and repeat sweet verses that rhyme. That others may be reached. the message that God still cares. A reception will be held in the Fellowship Hall immediately following this service.